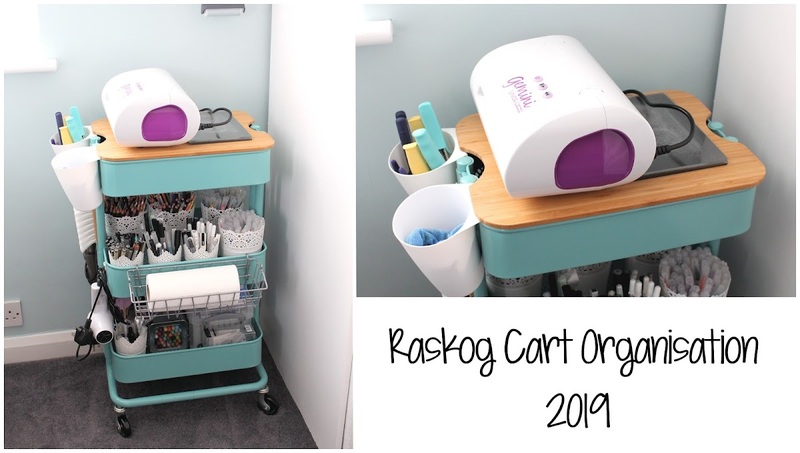 Hello there, if you have been following me for a little while, you will know that I love my Raskog cart. 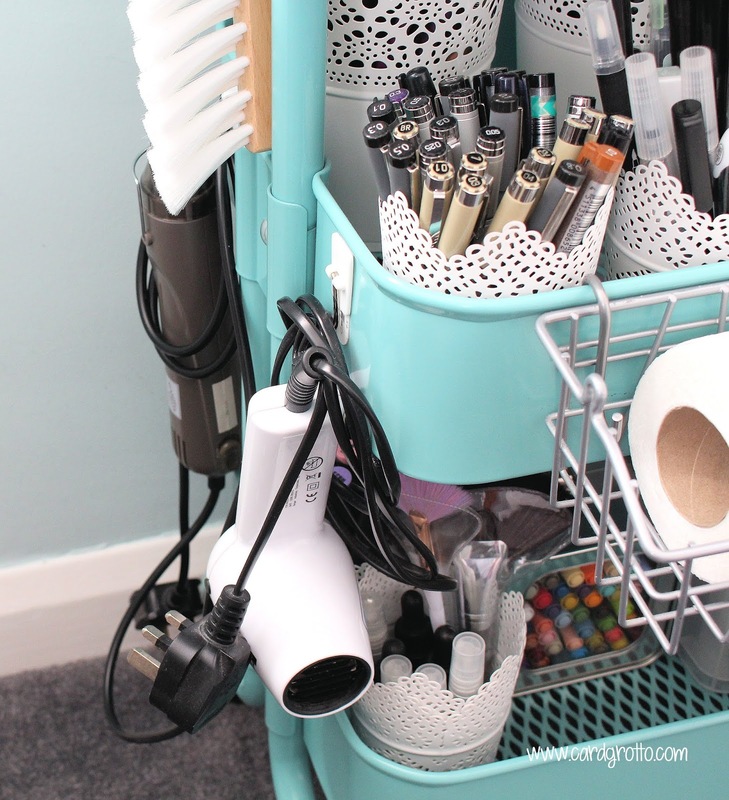 It holds so much stuff and when you have a small craft room like mine, you need all the storage space you can get! I recently picked up the Hogsma Cutting Board to put on the top of it to create a die cutting station for myself. The Hogsma Cutting Board has indentations at the side so that it sits perfectly on the top of the Raskog. 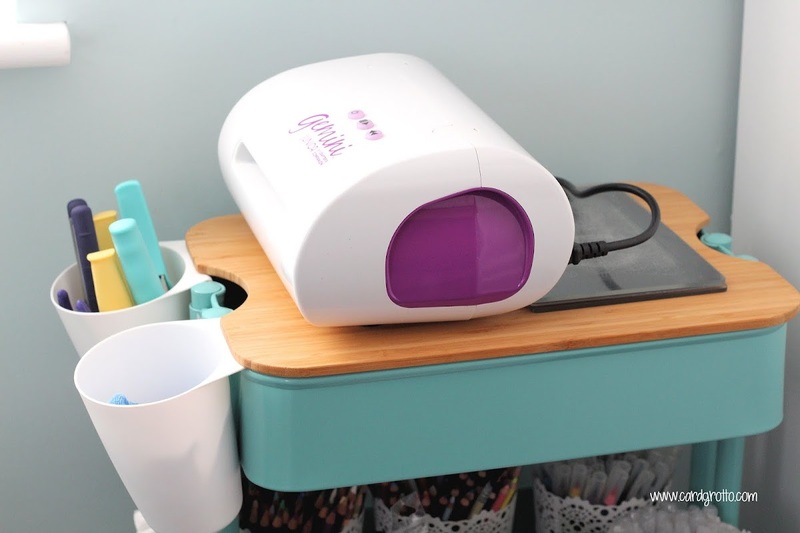 Up until now, I have been getting my die cutting machine out of my cupboard each time I want to use it and put it back in afterwards. To be honest with you, this has become hard work and so I wanted to see if I could keep it out all of the time. I was not keen to have it on my desk (I like to keep my desk fairly clutter free, where possible) but as soon as I saw the Hogsma Chopping Board, I knew it would be perfect to use for die cutting. 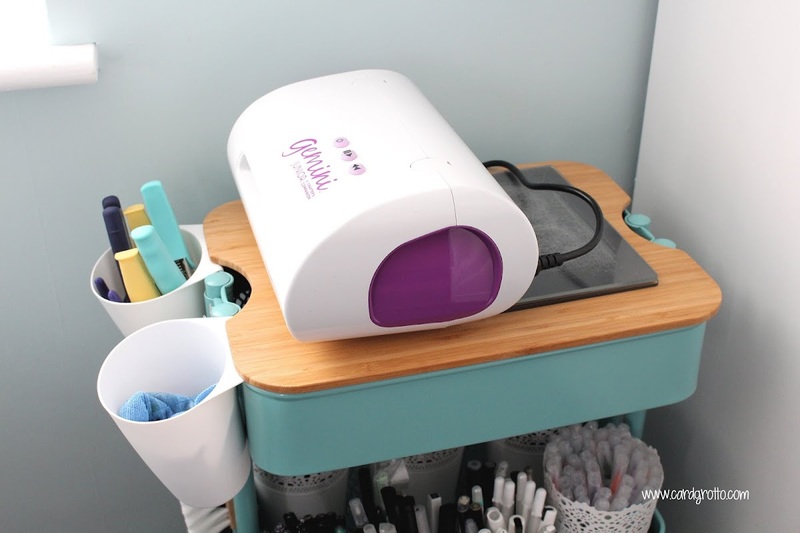 I do also use a Spellbinders Platinum 6 for die cutting but I can easily grab that and put it on my desk to use it, if needed, as it has a handle. The Gemini Junior doesn't, so that's why I opted to put the Gemini Junior on there as it is harder to move. There is enough space on the top to run my cutting plates through and I have a plug socket next to my Raskog so I can plug my Gemini Junior in when I am using it. I added a 3M hook to the back so that I can hang up the cord to keep it out of the way. 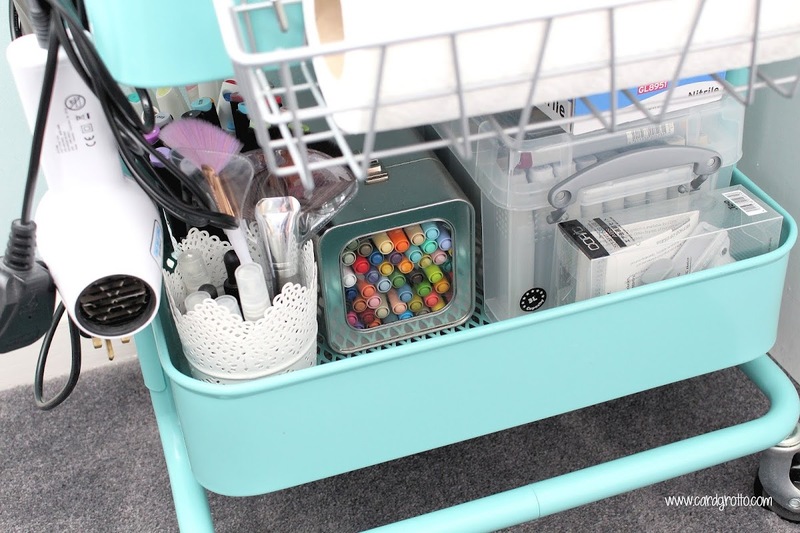 The next tier of my cart holds a lot of my pens and pencils. I have them in the Skurar cups from Ikea. 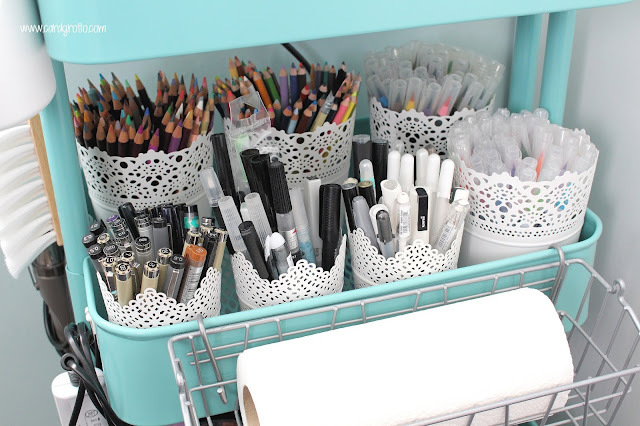 The small ones are labelled as candle holders and these hold my multi-liners, water brushes, gel pens, sparkle pens etc. the bigger version are labelled as plant pots and in these I have my Zig Clean Color Real Brush Pens, Arteza Real Brush Pens, Prismacolor pencils and Derwent Coloursoft pencils. I have a basket at the front which holds paper towels. Sadly, this has been discontinued but the OMAR Clip On Basket looks very similar. The bottom tier holds more cups. these ones hold mini misters and dropper bottles, Aletenew Artist Markers and Tonic Nuvo Aqua Flow pens. I have my Distress Markers in the Tim Holtz Tin and next to that my Copic Refills in a Really Useful Box, as well as my Copic Airbrush attachments and some gloves. To the side of the cart are my heat tools (and an art brush), these are clipped on with 3M hooks. Here are the links to what I shared in the video. 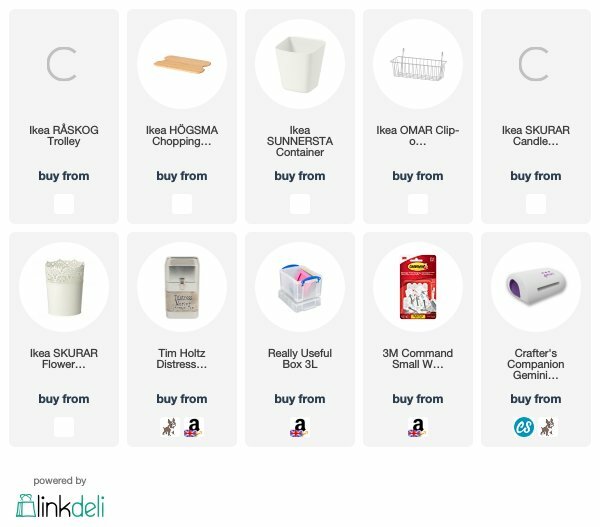 Affiliate links are used on some products. 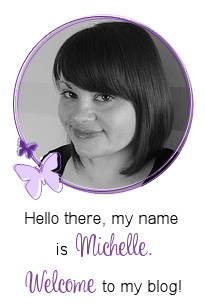 This means that if you make a purchase after clicking on my link, I receive a small commission with no extra cost to you. I truly appreciate your support when using these links. Please click on the logo below the product to shop at your favourite store. 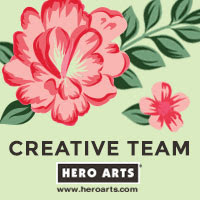 All products were personally purchased except those from Clearly Besotted, Hero Arts or those marked with an asterisk (*) which were kindly sent to me to use. You can read my full disclosure here. I really like how this is working for me. I am finding it so much easier to die cut now. Thank you so much for stopping by today, I really do appreciate it. I hope you have a great rest of the day!